An exciting race is expected for the £1 million King George VI and Queen Elizabeth Stakes taking place this Saturday. A mere mile and a half separates the ten runners from that prize, and with the absence through injury of leading contender St Nicholas Abbey, it opens up various opportunities for other runners. At the top of the list of runners looking to capitalise on St Nicholas Abbey misfortune will be Cirrus Des Aigles, but Novellist and Trading Leather will be keeping a close eye on him throughout. The best place to have a bet on the 2013 King George VI and Queen Elizabeth Stakes is with Bet365.com. The odds below were taken from the site, and you will be able to find the latest race odds there as well. Bet365.com is also offering each-way betting on the race, with which you will receive 1/4 if should your selection place in positions one to three. Cirrus Des Aigles was the world’s highest ranked horse at the start of the year, so comes with a fine pedigree. He has a good record at Ascot, where he won the 2011 QIPCO Champion Stakes and finished second to supreme Frankel in the same race the following year. 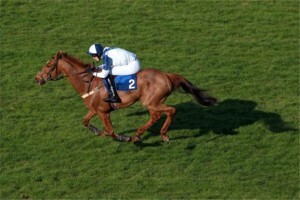 The now seven year old horse finished a disappointing fifth on his return run at Saint-Cloud last month, finishing behind Saturday’s second favourite, Novellist. Andreas Wohler-trained Novellist won that race comfortably and has seen victory in his three last starts. The German horse will be looking to following the footsteps of his compatriot Danedream, who left Ascot with the prize last year. Pushing these two all the way will be Trading Leather, who won the Dubai Duty Free Irish Derby earlier in the year. The Jim Bolger-trained horse stepped up comfortably to the mile and a half distance in that race, and Bolger will be hoping that he can repeat that performance this weekend. Sir Michael Stoute also has a horse in the running on Saturday in the form of Hillstar, and a victory could give the trainer a record sixth victory in the event. The three year old won the King Edward VII Stakes by a length last time out. As mentioned above, the best racebook to place a bet on the 2013 King George VI and Queen Elizabeth Stakes is Bet365.com, who will offer the best odds on the race. When visiting Bet365.com, click on ‘Horse Racing’ in the left sidebar and scroll down to the Antepost section of the page, where you will find the markets for this race and many more. The King George VI and Queen Elizabeth Stakes is a Group 1 race held at Ascot Racecourse in England and is run over a distance of one mile and four furlongs. It is Britain’s most prestigious open-age flat race and has a purse of GBP 1 million. The race became part of the Breeders’ Cup Challenge series in 2011, and the winner earns automatic invitation to compete in the Breeders’ Cup turf. The 2012 renewal was won by Danedream.